When you install the OverDrive app, you'll see several options for signing into the app the first time you open it. It's important to always sign into the app using the same method. This is especially important if you download ebooks in the app, because if you download an ebook under one sign-in (or "authorization") method, you can't download it again under a different one. 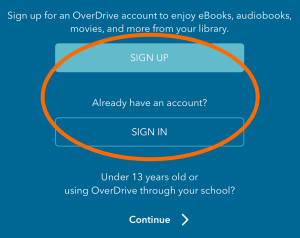 Signing in with an OverDrive account (using an email address) comes with lots of added benefits, like the ability to sign into (or "authorize") other installations of the OverDrive app and Adobe Digital Editions on a computer (so you can download the same ebooks in each place). Also, once you start adding libraries in the OverDrive app, you can use your OverDrive account to sign into any library that has switched to the new OverDrive. To sign into the app with an OverDrive account, select Sign up or Sign in when the app first opens. Then, enter your name (if prompted), email address, and password to sign in with (or create) your OverDrive account. The Facebook option comes with all of the benefits of a traditional OverDrive account, except that you can't use it to authorize Adobe Digital Editions to download ebooks on your computer. To sign into the app with your Facebook account, select Sign up or Sign in when the app first opens. Then, select Sign up using Facebook (or Sign in using Facebook). Note: The library card sign-in option is supported for most libraries, but not all. If your library isn't supported yet, please try a different sign-in option. The library card option comes with some of the benefits of a traditional OverDrive account, except that you can't use it to authorize Adobe Digital Editions. Since the library card option doesn't require a name or email address, it's a great choice for users under the age of 13. To sign in with your library card, select Sign up or Sign in when the app first opens. Then, select Sign up using library card (or Sign in using library card). Learn more about signing into the app with a library card here. The under-13 sign-in option is recommended for users under the age of 13 who can't sign in using their library card. You can only use the under-13 option to sign into one installation of the OverDrive app, which means you can't use it to download the same ebooks on multiple devices. Learn more about the under-13 option here.